The work of the Next Steps NH project is grounded in Implementation Science. Implementation Science teaches us to start with the end in mind – first, determine where we want to be. Many implementation efforts fail because someone underestimated the scope or importance of preparation. It’s important to know the program you are trying to implement and what supports are needed for success. Implementation research is the scientific study of methods to promote the systematic uptake of evidence-based practices into routine practice, and hence, to improve the quality and effectiveness of . . . services and care (Eccles & Mittman, 2006). 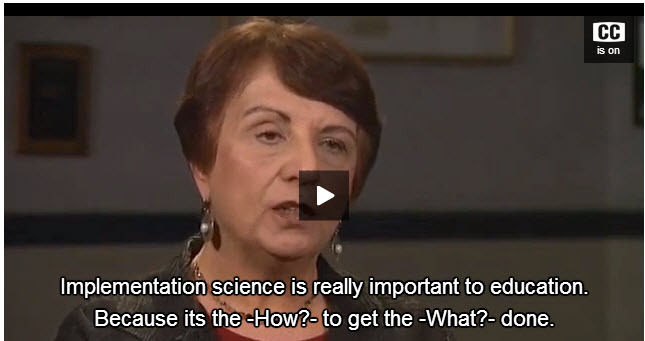 Karen Blase gives a 1:29-minute overview of applying implementation science in education. 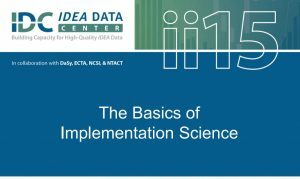 The Basics of Implementation Science (PDF, 2015, 28 slides) is a PowerPoint presentation that reviews key elements of implementation science, from the 2015 IDEA Data Center Interactive Institute. 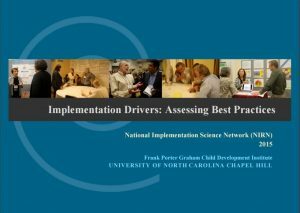 Implementation Drivers: Assessing Best Practices (PDF, 2015, 52 pages) is a publication of the National Implementation Science Network. There are three types of implementation drivers: competency, organization, and leadership. Implementation drivers come into play once you have a well-defined change you want to make. Check out resources from the National Implementation Research Network (NIRN). 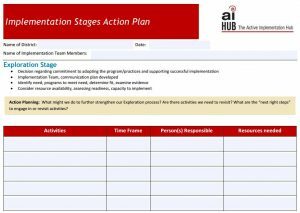 There is a reference page with well-organized pages to read through: Learn Implementation. There’s also training modules with a combination of videos and reading: Get Started/Get Better with Implementation. The State Personnel Development Network maintains a resource library for Implementation Science & Scaling Up. These videos will help demystify implementation science and give you an understanding of some important fundamental concepts, in nice short chunks! The first one is a high-level look at the art and science of implementation, from the Ontario Center of Excellence for Child and Youth Mental Health, in 3:54-minutes. The following five videos were funded by the Canadian Institutes of Health Research. Each one succinctly captures an important piece of implementation science. To put implementation science theory into practice, we’re using the Participatory Adult Learning Styles (PALS) model for the training and coaching we provide our cohort schools. PALS is an evidence-based practice grounded in Implementation Science, developed by Carl J. Dunst, PhD and Carol M. Trivette, PhD. Slide 28 from Adult Learning Principles and Practices presentation. Click image to download the full presentation. The contents of this website were developed under a grant from the US Department of Education, H323A120003. However, those contents do not necessarily represent the policy of the US Department of Education, and you should not assume endorsement by the Federal Government. Project Officer, Corinne Weidenthal.